Lock in a great price for Hotel La Closerie – rated 8.9 by recent guests! The bed was very comfortable and the hotel was only 5 minutes from the beach. Parking was good behind the hotel. A stylish, charming hotel with delightful owners, a spotlessly clean and well-appointed room and an amazing breakfast. Private parking is a great boon, and the hotel is only short walk from the wonderful beach at La Baule. Staff/owners were friendly and helpful, they moved us to another room for the second night when we found the first room too hot to bear. Location to beach front and restaurants. Private car park. Fabulous and welcoming owners & dog. Les petits gâteaux préparés par la patronne chaque matin pour le petit déjeuner. Un super accueille, des gens très gentils et à l'écoute. Un hôtel propre et confortable. Accueil vraiment très chaleureux. Navette aller et retour très spontanément proposée. Ambiance de pension familiale appréciée. Je reviendrai et je recommande. L' accueil, le confort de la literie, le petit déjeuner copieux et excellent avec des pâtisseries maison. La Closerie is located in La Baule, 650 feet from the beach, the market, the Thalasso-therapy center and Atlantia Congress Hall. Free private parking and a garage for bicycles are available on site. The uniquely decorated rooms have a private bathroom with a shower. They also have a TV and telephone, and they are decorated with seagrass matting. It has a terrace where you can enjoy a continental breakfast. Free Wi-Fi internet access is available. Additional features include a communal lounge and upon request guests can enjoy cold and hot drinks in the lounge or in the terrace. Tennis courts, mini golf and horse riding are all available nearby the hotel. When would you like to stay at Hotel La Closerie? This room features a TV, telephone, wardrobe and desk. The private bathroom includes a shower. Composed of a double and twin room, this family room features a TV, telephone, wardrobe and desk. The private bathroom includes a shower. The twin can include either 2 single beds or 1 bunk bed (not suitable for children under 6). Please specify the age of your children during the reservation process. This room features a queen-sized bed, TV, telephone, wardrobe and desk. 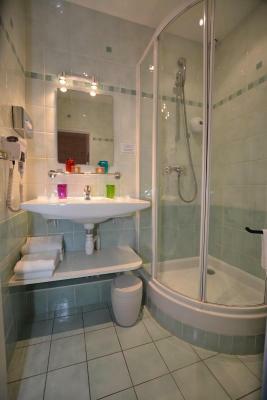 The private bathroom includes a shower and a hairdryer, while the toilet is separate to the bathroom. One of those rooms can accommodate a baby cot upon reservation. 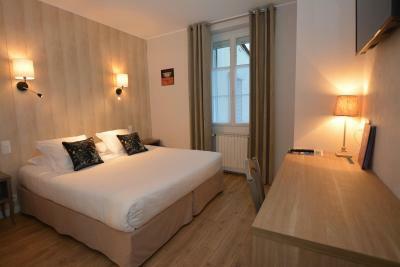 Please note that for a twin bed configuration, there will be an extra charge of EUR 12 per night. House Rules Hotel La Closerie takes special requests – add in the next step! Hotel La Closerie accepts these cards and reserves the right to temporarily hold an amount prior to arrival. The property accepts Chèques Vacances holiday vouchers as payment. It needs air conditioning. Being on a noisy street you must close the windows in rooms at the front but this is impossible in heavy heat.